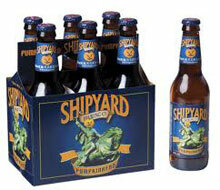 PORTLAND, ME — Shipyard Brewing Company announced today that it will be extending the season for their popular fall release, Pumpkinhead. The brewery originally planned on brewing the beer through October, but will now brew additional batches through November in order to meet consumer demand. The brewery said the expanded production will allow consumers to purchase the beer into December. Shipyard also contract brews for various other breweries, but said that already scheduled brew days for those brands will not be impacted. In April, the brewery installed two new 300 barrel fermenters and one new 100 barrel fermenter, allowing them to brew one more batch of beer every day. “There is not another minute in the day for an additional brew,” said brewery spokeswoman Tami Kennedy. The expansion gave Shipyard the ability to brew up to 180,000 barrels annually, up from 140,000. Pumpkinhead is available in 6-packs, 12-packs and on draft. The retail price for 6-packs ranges between $8.99 and $9.99 depending on location, 12-packs between $16.99 and $17.99. Distributors looking to get their hands on Pumpkinhead will be able to order this product from Shipyard through the end of November. Pumpkinhead Ale is currently available in 33 states, including: AL, AR, AZ, CA, CO, FL, GA, IA, ID, IL, IN, KS, MA, MD, ME, MI, MN, MO, MS, NC, NE, NH, NJ, NV, NY, OH, OK, PA, SC, TN, VA, VT, and WA.